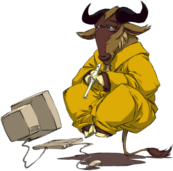 December 21, 2013: Binaries for Windows and GNU/Linux. Circular kinematics of particles 2D. Static of rigid bodies 2D. Circular dynamics of particles 2D. The static and dynamic problems are entered constructing the free body diagrams of the objects. Although FísicaLab is easy and intuitive, we recommend you read the help files first before set any problem. You can access these files in the option menu Info -> Help (or FisicaLab -> Info -> Help). Also you can get the manual at User manual section. Download video in ogv format. 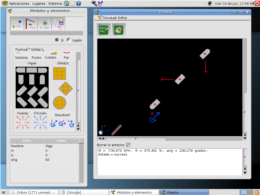 FísicaLab is free software (free as in freedom), published under the GPLv3. Or (at your option) any later version. You can get help, write comments or report bugs on the general discussion list of FísicaLab. To suscribe click here, or you can see if your question have answer now on the archives here. To report a bug, please provide information as much as possible: information machine, operative system, version of the operative system, GSL version, GNUstep version, and a description of the problem.